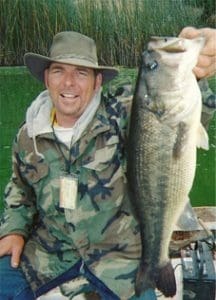 “My friend Bobby years ago realized the largemouth bass he just caught coughed up a little bird and it was still alive. I began thinking, “I should make a bird lure,” and the process began. I started off utilizing the popular Rat Baits and building the topwater lure for bass with bits and pieces from my garage tackle shop, always adjusting and one day “Bam! Holy Shmoli! It all came together and we realized this Bird Lure can catch bigger bass! Being top water bait addicts, we really needed a largemouth bass lure that would mimic the many non aquatic species of birds on our small lakes of Watsonville, California. I am lucky to have these small lakes near my homestead, which affords me a lot of top water fun for testing lures. My friend and I use homemade John boats to fish our small lakes of Watsonville, California. We promote barbless hooks as our fish are our friends. Topwater lures for bass such as the frog are great, however, why would you use a frog to imitate one of the many non aquatic birds on your lake? Not quite sure what to do? Maybe you want to see some pro tips on using the bird? Or maybe you’ve just purchased the bird and want to know how to tune it for the best possible outcome? Look no further! Below you’ll find a collection of videos that tell you exactly what to do before and during your next big bass fishing trip.